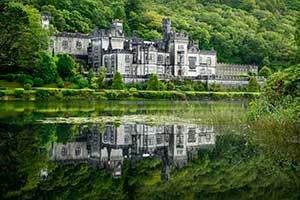 The University of Notre Dame and the Benedictine Community at Kylemore Abbey in Connemara, County Galway, Ireland, have formed a partnership to create a center to advance their shared spiritual, cultural and educational missions. The programs offered by the center will draw both upon the rich tradition of Benedictine spirituality and the academic rigor of Notre Dame. Programming, which will include courses of varied length and span a variety of academic disciplines, is expected to begin in 2016. The partnership enjoys the support of Notre Dame trustee and Irish businessman, Martin Naughton, as well as a number of Notre Dame benefactors in the United States. This partnership expands the University of Notre Dame’s international engagement, a portion of which is mediated through its network of Global Gateways. The University’s six Global Gateways—located in Dublin, Beijing, Chicago, Jerusalem, London, and Rome—provide academic and intellectual hubs where scholars, students and leaders from universities, government, business, and community gather to discuss, discover and debate issues of topical and enduring relevance. Additionally, the University’s Keough-Naughton Institute for Irish Studies is a teaching and research institute dedicated to the study and understanding of Irish culture in all of its manifestations. The Institute supports undergraduate and graduate students in their pursuit of Irish Studies and provides opportunity for language study, travel classes, semester and summer study in Dublin, internships in Dublin, conference support and more. Originally published by Sue Lister at news.nd.edu on May 08, 2015.